In late 2004 a new band called Finsterforst was founded by Tobias Weinreich (Bass), Sebastian Scherrer (Keyboards), Marco Schomas (Vocals) and Simon Schillinger (Guitar). As the line-up was not completed, the band instead concentrated on songwriting. So, in the first months many songs were created without being performed by the members. In spring 2005 the band decided to work with an accordion player (Johannes Joseph), as all titles needed an accordion. Beginning May '05 the band started to practice their songs. However, the band still have not found a drummer and a rhythm guitarist. In October '05 David Schuldis, a rhythm guitarist, joined the band. 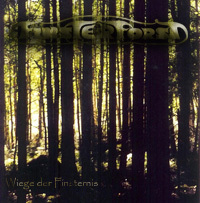 After some scheduling the band entered the studios in December '05 and recorded a 3 track EP entitled "Wiege der Finsternis". The band, after signing to Worldchaos Production in December '06, will be recording their first LP from February to March 2007. Tentative release date is late May/early June.